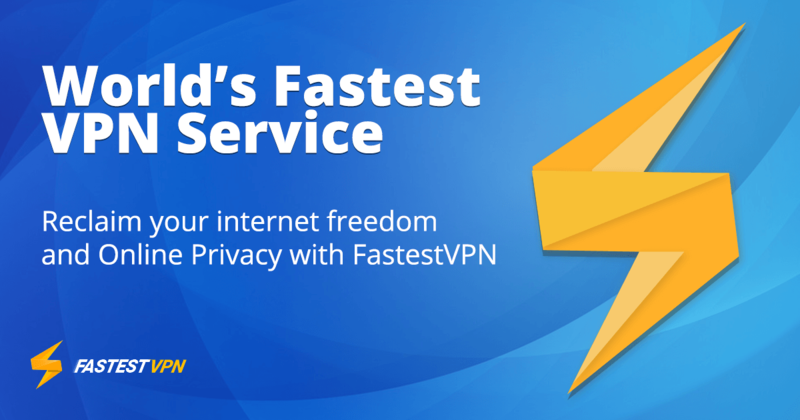 FastestVPN is an ultra fast and simple VPN service designed for people who looking for a premium VPN for security, privacy, and the convenience of being able to access the entire internet with no restriction. This VPN features with a global network of 150+ high-speed servers in 23+ countries and employs a strong 256-bit AES encryption to keep your data safe, as well as protect your identity on the internet. Among the 150+ servers, there are some ultra-fast servers optimized for P2P traffic worldwide. So, FastestVPN is good at hiding your location and helping you stay private while sharing files or simply browsing the web. You also can use it to download and stream HD videos with zero buffering and complete anonymity. Like many other reputable VPNs, FastestVPN also follows a strict no-log policy so your online activity can always stay private, and no one can get their hands on your private information. With FastestVPN, you can easily bypass geo-restrictions and unblock any website you want. Wherever you are, you can get unlimited access to all geo-restricted content from popular streaming services like Netflix, Hulu, BBC iPlayer, Spotify and more. FastestVPN comes with Kill switch, NAT Firewall, Free Ad-Blocker, and Unlimited Server Switches. All these features add an additional layer of protection to your connection against online threats. With a single account, FastestVPN allows up to 10 simultaneous devices at a time. So, no matter how many electronics you connect to your home network, they’ll collectively count towards one VPN connection. Overall, FastestVPN is a perfect choice for people who want to bypass geo-blocks, annoying firewalls, and government censorship and protect their data against mass surveillance, advertisers, and hackers. Try it risk free for 7 days!